Recently, I was privileged to visit Portland, Ore., and had yet another opportunity to appreciate why the Supplemental Nutrition Assistance Program Employment and Training (SNAP E&T) Program is so important. SNAP E&T, which is available in all 50 states, is a skills and job training program designed to help SNAP participants prepare for and secure jobs that lead to economic self-sufficiency. Along with Oregon Department of Human Services’ (DHS) Administrator Belit Burke, I visited Central City Concern (CCC), an organization that partners with DHS to provide E&T services to those in need. Annually, CCC provides vital services to approximately 13,000 people, many of whom are SNAP recipients who have been affected by homelessness. Their clients often have significant barriers to employment – such as lack of transportation and childcare or little education or work experience – and need multiple interventions to stabilize their lives, much less to find a job. During our visit, we learned about Shelby, who began receiving CCC services in December 2014. She had struggled with substance abuse issues and homelessness and needed help to become stabilized. CCC was able to do that by providing her an array of services. Once Shelby was in a better place, she began participating in the SNAP E&T program where she learned skills, received training, and participated in community volunteer opportunities. Eventually, Shelby was matched with a competitive job that aligned with her skills, interests and career goals. Shelby now lives independently in her own apartment; she wanted to join our visit but was unable to attend because she was working. Shelby is only one of the countless people who have been helped by CCC and the SNAP E&T program, helping her move from homelessness and addiction to employment and independence. CCC is only one of several providers in the Portland area that is part of Oregon’s SNAP E&T program. Oregon continues to expand and is looking to add community colleges and workforce investment boards to its mix of service providers in 2017. 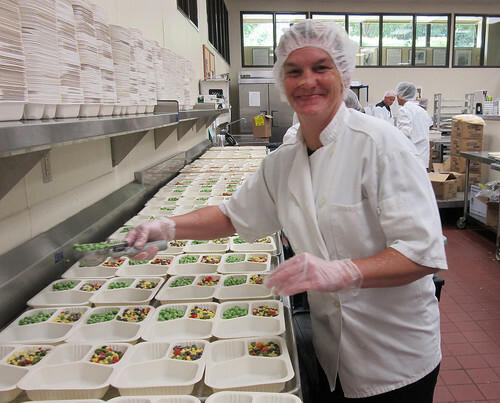 By diversifying and aligning the missions of its provider partners, Oregon can help SNAP recipients like Shelby not only obtain their first job, but also receive training and credentials that will help them advance their careers and increase earnings so that they are able to transition off of SNAP benefits. I was touched to hear about real people and families that continue to be impacted by our programs. Evidence continues to emerge demonstrating that job search strategies alone are not sufficient to help people overcome poverty and dependence on welfare programs. Instead, it takes services to reduce barriers and stabilize lives and to provide education and skill-building opportunities that move people into good jobs. Oregon is poised to become a national leader in SNAP E&T, and organizations like CCC are helping SNAP recipients not only take those first critical steps but also to believe they can reach their goals.